Despite it being a coloring book for grownups, this coloring book contains neither meditative mandalas nor strictly stipulated motifs. 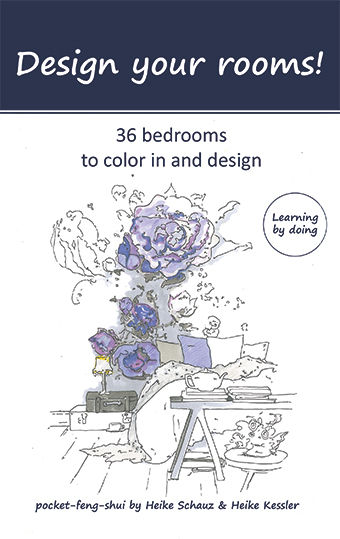 On the contrary: in their first pocket feng shui coloring book, business feng shui consultant Heike Schauz and illustrator Heike Kessler have scribbled 36 dream bedrooms that everyone armed with colored pencils is completely free to color, hatch, color in or color further. „Design your rooms“ is the motto. It’s all about getting a feeling for harmonious room design – without any esoteric aids. By handling colors, shapes and material structures themselves, i.e. learning by doing, readers get to know the principles of modern feng shui in a playful way. The hand-drawn illustrations of various room situations not only awaken creativity. They also provide numerous impulses for developing your own living and feel-good ideas. This pocket feng shui coloring book contains 36 individual furnishing styles for bedrooms. – for coloring in at home, in a café, in trains and, of course, in furniture stores and outlets dealing in living accessories or interior design. Further editions containing design tips based on feng shui principles are to follow.